Mold pollutes indoor air with spores that can be inhaled and as a result cause serious health risks. The Institute of Medicine (IOM) found evidence in 2004 to link indoor mold exposure to upper respiratory tract symptoms, cough and wheeze in healthy people and respiratory illness in healthy children. Those with asthma are more vulnerable to the health dangers of mold and some IOM studies indicate a linkage of exposure to damp areas to the development of asthma. Visual: If you can see mold growth, no matter how small, take immediate action. Some smaller amounts of mold growth may look like soot or dirt in corners of your windowpanes, bathtubs or showers. These small amounts may indicate a larger, hidden mold problem. Smell: If you notice a musty smell in your home, there’s a good chance you could have mold hidden somewhere. Don’t ignore these odors if you can’t see any mold. Feel: If you run your hands along the surface of your walls and they are damp, bowed, bulging or warped, or if your paint or wallpaper is peeling, that’s a telltale sign that moisture has gotten into them leaving a breeding ground for mold. Allergic Reactions: Mold is an allergen that can cause a range of allergic reactions. If you experience coughing, sneezing, wheezing or other respiratory symptoms while in your home, but they subside when you are away, then mold could be the cause of your allergic reaction. Mold thrives in damp places and it reproduces through spores and may begin developing in your home when these spores land on wet areas. 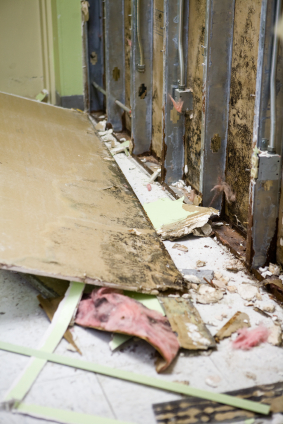 You should check for mold after a water leak in any of your plumbing, a leak in the roof or a recent flood. Rooms in your home that are prone to contain moisture like bathrooms, laundry rooms and basements are the best places to start when looking for mold. Assessment: A Rainbow International specialist will verify all of the mold-affected areas, pinpoint the source of the problem, and develop a remediation plan. Containment: The source of the moisture will be enclosed to avoid contaminating the rest of the home as spores can stir up during the removal process. Filtration: Your Rainbow International specialist uses HEPA filters to clean spores and other particles out of the air. HEPA is a type of filtration media that effectively removes microscopic particles from the air such as mold. Removal: Since mold is a living organism and can embed itself into materials to survive, it is best to dispose of any porous materials. Nonporous materials can be cleaned with antimicrobial cleaners, and sealants may be used to help materials that have been treated to be more resistant to further mold problems. You may need to have your air ducts professionally cleaned as well. Drying: Your items that have been cleaned and repaired will be thoroughly dried by our professionals. A Rainbow International mold removal specialist will likely go over moisture management strategies with you to ensure your home doesn’t encounter future mold problems. Repair: The reconstruction process will begin after all contaminated materials have been removed. Immaculate, mold-free materials will supersede what was initially contaminated. Testing: Following remediation, we probe for any signs of recurrent water damage, odors or visible mold to insure that the mold has been cleaned properly. Fixing any water damage and controlling the moisture in your home is the best way to avoid mold infestations. Rainbow International cares about your family’s health, so if you think you may have mold in your home, give us a call at (847) 673-3473. We can evaluate for mold, remove it and repair any possible water damage causing the mold growth.